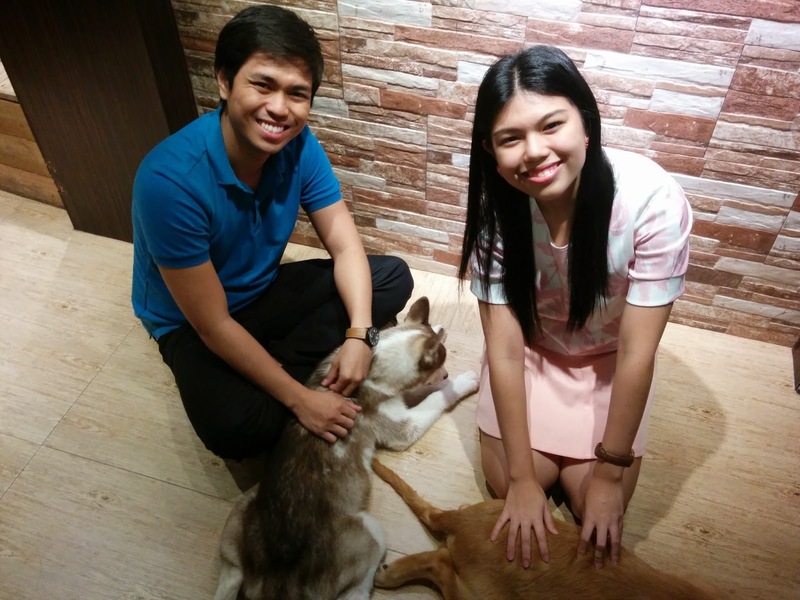 Best decision of the weekend: Ludwin and I visited the Barkin' Blends Dog Cafe in Katipunan last Saturday. Ever since I got word of the coffee shop opening, I've been telling him we should drop by because he's such a dog person, and I knew it was something he'd very much enjoy. Fun fact: I'm not a person who has a soft spot for pets. Sure, I grew up with dogs in our yard and I once had a pet lobster (which I kept poking with a ballpen, HAHA) but I was never the ardent animal lover. I've always been rather indifferent towards them. For me, okay they were cute sometimes but they were just there, not something I'd mind on my own. I acknowledged their cuteness, I respected other peoples' devotion to them, but I felt no need nor compulsion to play with them, touch them, or more so take care of them. In fact, the only animal I ever truly fell in love with were elephants. (When I first saw an elephant up close in Thailand, I was smitten. They're the nicest, gentlest creatures on the planet. But see, elephants aren't exactly animals you can domesticate, play with on weekends, and actually call a pet.) I just didn't care that much about animals. The only ones I really cared about are the stuffed ones on my bed, really. Now, we end up talking about puppies and dogs 70% of the time. He named the puppy I got from my cousin last year (Alaska, because he's white!) I nicknamed the labrador they received a few months ago (He's officially named Josh, but I call him Poopie, because he's such a cuuuuute wittttleeeee puuuuupppyyyyyy). Which is why it was so exciting for us to have finally, FINALLY found the time to go to the aforementioned Dog Cafe. The verdict? Puppy love, indeed! So like I said, the only dogs I ever really cared about before Ludwin and I got together were toys - i.e. the stuffed dogs from Ikea that everyone in our family has. On the Vistan side, we all have at least one of those golden retriever plush toy puppies from Singapore - and we all invented back stories and character quirks for each of them :)) They're so cute and huggable! They're the best kind of dogs to have! Haha! But anyway, I really, really find golden retrievers so adorable, and I've told Ludwin before that if I ever decide to get a pet, that's what I'd love to have. 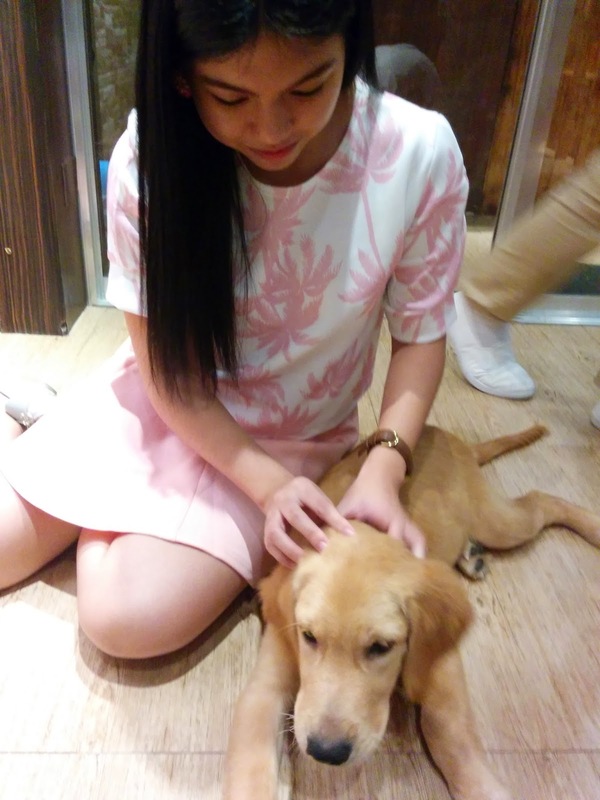 Imagine my delight when I finally got to play with a golden retriever for real! Robin was so well-behaved and sweet. He kept nuzzling his nose by Ludwin's feet, and just stayed put when I started scratching his back. He was sooo cuuute! It was so nice to finally get to hug a real, actual, living golden retriever! As for Ludwin, he's always wanted a Siberian husky. It's such a boy's dog, and I'm actually not surprised it's his favorite. He was so thrilled he got to play with Skye, the resident husky of the cafe. I expected Skye to be fierce or "suplado" even, because they look mean, right? But he was super gentle. He just kept licking his paws! And he loved nestling by Ludwin's legs. Well, it takes one alpha male to know one. :)) "Bro, what's up, I like your shoes, I will lick you to show you my appreciation!" We really had a great time - we haven't been on any date like that before! It was so much fun just sitting there and playing with the dogs, all kinds and shapes and sizes. We didn't get to take a picture with the others we played with (like the beagle, the Chinese shar-pei, and the lhasa dogs) because some of them were "free spirits" and liked walking around the room, doing their own thing. The place was so much nicer than I expected. The Dog Zone is a separate room from the actual cafe, which means it's really clean, hygienic, and safe. It's Php 180 for two hours inside the room, and inclusive of a milk tea or fruit tea drink. There are other options like coffee too, but you have to pay a little extra. They have very strict and particular rules for the Dog Zone, which is completely reasonable I think. You can't carry the dogs around, you can't feed them, you can't run around with them. You also can't bring your own dog. But it's perfectly understandable; you wouldn't want to upset the resident dogs by being too aggressive or by bringing in another canine who may not be as trained as they are. I really appreciated the fact that the place smelled great. It smelled like a spa! They have a lot of fresheners and air purifiers, and the staff clean up after the dogs really quickly. They have hand sanitizers, alcohol, and wipes at hand for the customers too. That's one of my biggest issues about animals when I was growing up - I wasn't too fond of touching them because I had the impression that they were dirty. But that's not at all a concern here. You can definitely hug and carry them on your lap; no stinky dog smell to worry about! Perhaps my only beef with the place is their food. We had dinner first before going inside to Dog Zone. We ordered chicken teriyaki and grilled pork, and we were disappointed. The serving was small, even for one person. The food was dry and seemed like it just came out of the microwave. Tasted like cheap cafeteria fare, to be honest. 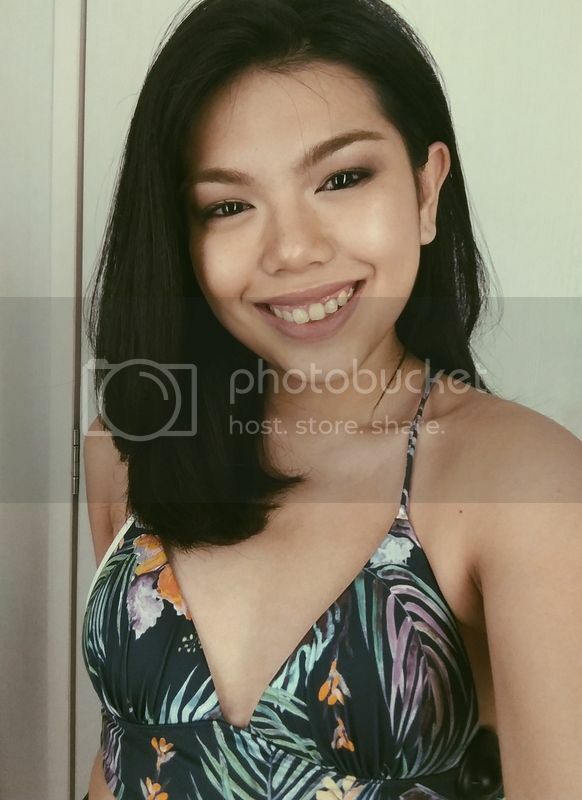 (Actually, mas masarap pa yung sa CASAA.) Their tea was just okay. I ordered lychee fruit tea, and Ludwin got lemon. Nothing special: not great but not terrible either. Maybe their coffee is better, since they are after all a cafe. It was a good thing we were going someplace else after (we met up with his college friends at Tomatokick later that night) so we had the chance to eat again. Their menu definitely felt and tasted like an afterthought of the brilliant "hang out with the dogs while having coffee" idea. 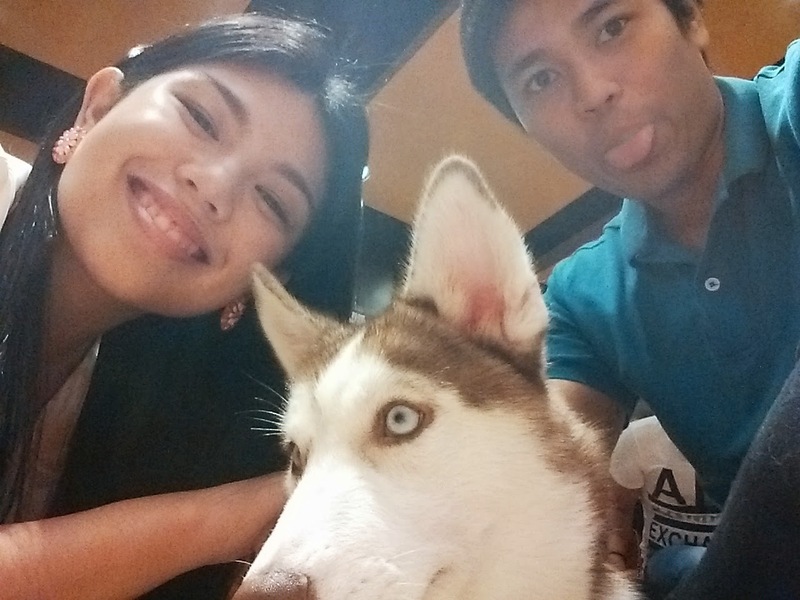 But then again, you don't go to Barkin' Blends to eat good food. You go there to enjoy the company of the dogs :) They deliver well on that part, and I really have no complaints. 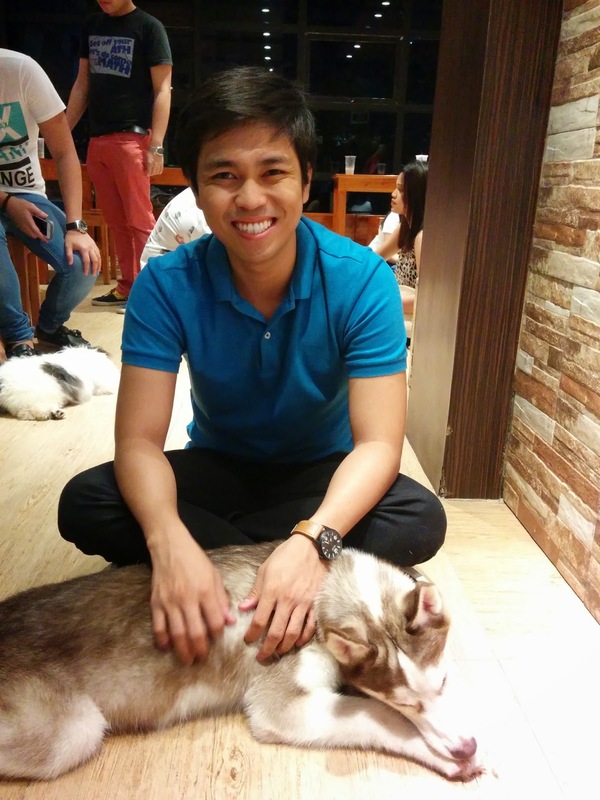 The Php 180 for the Dog Zone is definitely money well-spent, for both dog-lovers and non-enthusiasts alike.